Weekly Photo Challenge – “Converge” | It's a Wonderful World! 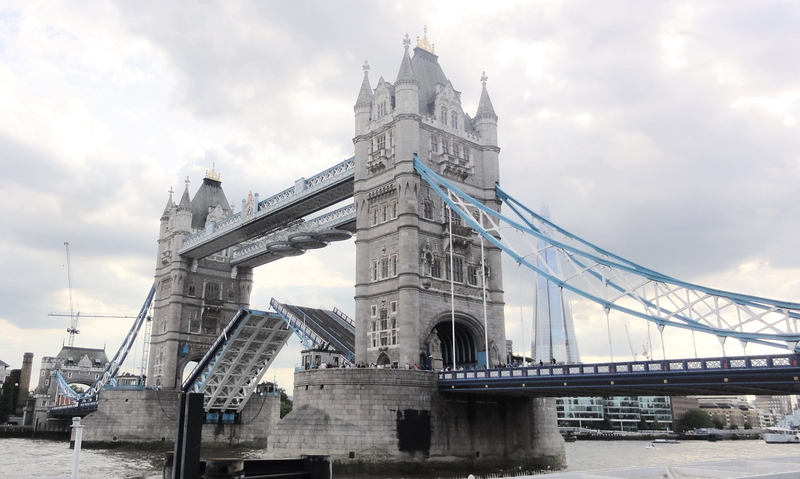 This picture shows the two giant roadways of the Tower Bridge in London converging back, after lifting to make way for a passing boat. The picture was taken in the summer of 2012, and you can also see the 2012 Summer Olympic rings on the roof that would retract before the roadways lifted, and came back to place after the roadways converged. Also, the Shard building can be seen in the background, the construction of which was, at that time, close to being completed. I love bridges, in all their different shapes and sizes, but the Tower Bridge is special and looks even more stunning when its lit up in the night. The roadways of the Bridge lift based on a pre-determined schedule which is available on its website. If you get a chance, do pay the Bridge a visit when its roadways are lifting and converging back. For more fascinating photo submissions on the theme “Converge”, click here. Thank you, Allane :)) I was just checking out your enticing pictures of Christmas in Germany! Wish you a very happy holiday season! Wow Shikha its always a joy to visit your blog! Lovely pic of Tower Bridge it looks so majestic. Regards.